“It’s death … or the ejection seat!” For Wally Schirra, command pilot of Gemini VI-A, steely nerves were a mainstay of his career as a naval aviator and as one of America’s first astronauts. As noted in Part 1, on the morning of 12 December 1965, aboard the tiny black-and-white spacecraft with his crewmate Tom Stafford, the countdown clock ticked to zero, the twin engines of the giant Titan II booster roared to life … and abruptly shut down. Clasping the D-handle which would have fired both of their ejection seats, Schirra was faced with a life-or-death decision. If he pulled the handle, he might—only might, for the seats themselves were inherently dangerous—save their lives at the risk of eliminating any chance to complete NASA’s goal of a manned orbital rendezvous before the end of 1965. On the other hand, if he didn’t pull the handle, Schirra and Stafford might survive … or perhaps meet their maker in a holocaust of flame as the Titan’s volatile load of propellants exploded. He elected to stick with his craft, and he and Stafford lived to fly another day. “Schirra,” wrote fellow astronaut Gene Cernan, “had balls.” Indeed he did. In emotionless tones, Schirra reported that propellant pressures in the Titan were dropping and test conductor Frank Carey responded with “Hold Kill” to denote that a shutdown had indeed occurred. When the smoke had cleared, and after receiving assurances that the ejection seat pyrotechnics had been safed, Pad Leader Guenter Wendt and his team returned to Pad 19 and Gemini VI-A to begin extracting the two disappointed astronauts. “It took 90 minutes to raise the erector and get us out, a lot longer than it should have,” wrote Stafford in his memoir We Have Capture. “Although he had kind words for Guenter and the pad crew, Wally was furious.” The families of the two men were also understandably anxious, and from then onward it would become standard practice to have another astronaut present with them during a launch attempt. The day itself was already a bad one: a Cape Kennedy rescue helicopter had crashed in the nearby Banana River, and Dr. Randy Lovelace—bane of the astronauts’ lives during their selection, courtesy of his invasive Lovelace Clinic—and his wife had been tragically killed in a private aircraft crash in Aspen, Colo.
A disappointed but relieved Tom Stafford (left) and Wally Schirra depart Pad 19 after the 12 December pad abort. Their quick thinking and actions that day helped to ensure that they could be quickly recycled to launch a few days later … and saved the rendezvous mission (Credits: NASA). Later that very same afternoon, President Lyndon B. Johnson told NASA Administrator Jim Webb that he had been “greatly disturbed” by the launch abort, although he was assured that enough time still remained to identify the Titan glitch, fix it, and then get Gemini VI-A into orbit before the end of Frank Borman and Jim Lovell’s Gemini VII mission. That glitch did not take all that long to find: an electrical tail plug had dropped prematurely from the base of the rocket and activated an airborne programmer—a clock in Gemini VI-A’s cockpit which should not have started until liftoff. The plug had rattled loose from its housing. Although the plug had been installed properly, tests revealed that some plugs did not fit as snugly as others and that they pulled out much more easily. In his autobiography, Wally Schirra wrote that, had he known of this “second” brewing problem at the time, he probably would have chosen to fire the ejection seats. As well as demonstrating the steely nerves of the Gemini VI-A crew—one of Schirra’s first messages had been “We’re just sittin’ here breathing”—the abort also verified, in the most dramatic manner possible, that the Titan’s malfunction detection system worked. Sensing no upward movement, it had correctly and automatically closed the valves to prevent more fuel entering the combustion chambers and had duly shut down the engines. Catastrophe had been averted, and Gemini VI-A rose spectacularly into orbit at 8:37 a.m. EST on 15 December. The launch was carefully timed to enable Schirra and Stafford to enter an orbit whose plane closely paralleled that of Frank Borman and Jim Lovell … and enable suitable conditions for a rendezvous on their fourth circuit of Earth. 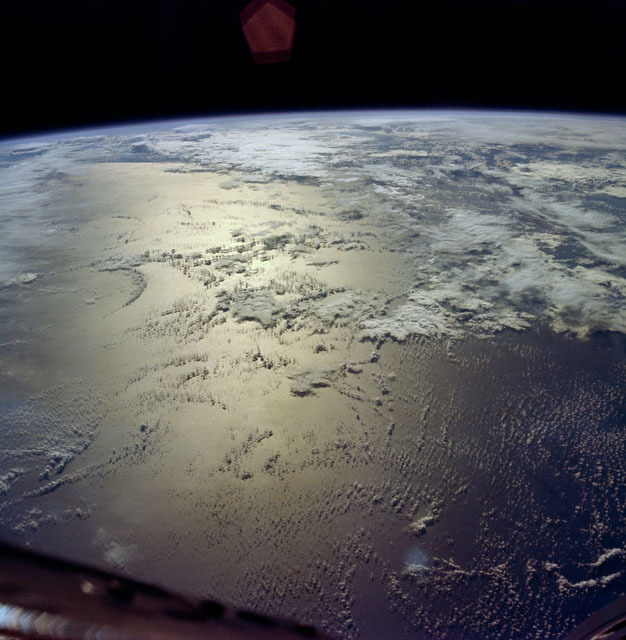 Glorious view of the Indian Ocean, captured by the astronauts of Gemini VI-A (Credits: NASA). Six hours of work awaited them. At orbital insertion, they were trailing Gemini VII by almost 1,200 miles. An hour and a half after launch, Schirra pulsed his ship’s thrusters to increase the apogee—the highest point of their orbit—to some 180 miles and close the distance to some 600 miles (960 km); this was followed at 10:55 a.m. by a “phase-adjustment” burn, whose purpose was twofold. 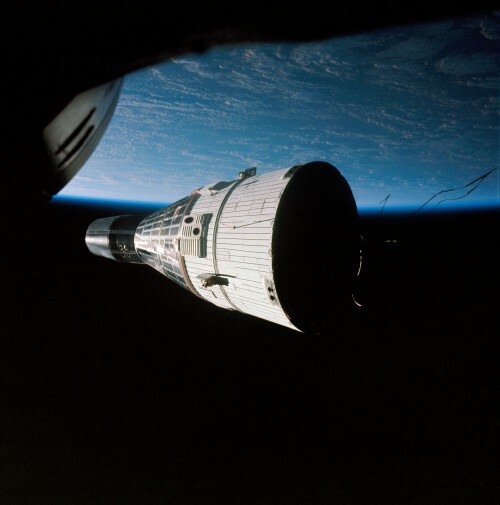 Firstly, it reduced the distance between them and the target, and secondly, it raised the lower point of Gemini VI-A’s orbit (its “perigee”) to about 120 miles (190 km). Most importantly, it established the timing for the subsequent chase. Half an hour later, Schirra turned the spacecraft 90 degrees to the “right”—in a southward direction—and again fired the thrusters to push Gemini VI-A into the same plane as Borman and Lovell. By this point, three hours after launch and entering their third orbit, they had narrowed their distance still further to about 300 miles (480 km). At 11:52 a.m., Capcom Elliot See told them that they should soon be able to establish radar contact with Gemini VII … and shortly thereafter a flickering signal was replaced by a solid lock-on. It wasn’t. It was Gemini VII, glinting in the sunlight just 60 miles (96 km) away. They lost sight of it briefly when it entered Earth’s shadow, but when their eyes adjusted they identified its blue tracking lights. Twelve minutes later, when the target was 40 miles (64 km) ahead and the geometry was correct, Schirra initiated the terminal phase manoeuvre designed to close the range to about two miles. He then executed a pair of mid-course correction burns and, at 2:27 p.m., just a few thousand feet from their target, started pulsing Gemini VI-A’s forward thrusters to steadily reduce the closure rate. Backdropped by the grandeur of Earth, Gemini VII drifts serenely in the inky darkness (Credits: NASA). From their vantage point in the “passive” spacecraft, Borman and Lovell had expressed fascination at the thruster bursts and spurts emerging from Gemini VI-A. At one stage, they were startled to see a tongue-like jet some 30 feet (9 meters) long! The rendezvous cost Schirra barely 38 percent of his fuel and left him plenty in reserve to fly a tour of inspection of, and station-keep with, Gemini VII for the five hours and three orbits. At one stage, Schirra maneuvered as close as a foot (30.4 cm), allowing he and Stafford to hold up a “Beat Army” card in their window to torment Borman, a West Point graduate. In response, Borman held up a “Beat Navy” card. Gemini VI-A moved to the rear of its sister craft, then came nose-to-nose, and so stable were both Geminis that, for a time, neither Schirra or Borman had to touch his controls. In fact, Mickey Kapp, producer of Bill Dana’s “José Jiménez in Orbit” album, had provided Schirra with a small, four-hole Hohner harmonica just days before launch. Schirra had secured it in one of the pockets of his space suit with dental floss. “I could play eight notes,” he wrote, “enough for ‘Jingle Bells.’ It may not been a virtuoso performance, but it earned me a card in the musicians’ union of Orlando.” Not to be outdone, Francis Slaughter, of the Cape’s Flight Crew Operations Office, had fitted small bells to the boots of Stafford’s suit … supposedly as a joke, but little realizing they would provide backing rhythm for Schirra’s Christmas soiree. Today, the tiny harmonica and Stafford’s bells are enshrined in the Smithsonian. Gemini VI-A splashed down safely on 16 December, followed by Gemini VII a couple of days later. 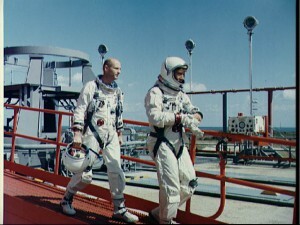 Despite their discomfort, Borman and Lovell had suffered few ill-effects from two weeks in space, and Schirra and Stafford had demonstrated that rendezvous between two piloted vehicles could be practically achieved early in a mission. Although triumph and tragedy would both characterize NASA’s path in space and on the ground over the next two years, the achievement of the two Geminis, just days before Christmas in 1965, had shown that the Moon was drawing ever closer and President Kennedy’s goal of bootprints on its dusty surface was steadily turning from a hopeless dream into a reality. Feature image caption: Beautiful view of Wally Schirra and Tom Stafford’s Gemini VI-A spacecraft, viewed by astronauts Frank Borman and Jim Lovell aboard Gemini VII. Schirra’s gutsy decision to sit tight after the 12 December pad abort ensured that this historic rendezvous mission could go ahead (Credits: NASA).